WOW… Great job !!! you are on your way! Thanks Lou…I will see you tonight. I like this photo Vince. Nice detail in the bee and flower! What a beautiful Macro. Wonderful detail in the flower and the bee. That was taken at the Pinelands Preservation place, right? 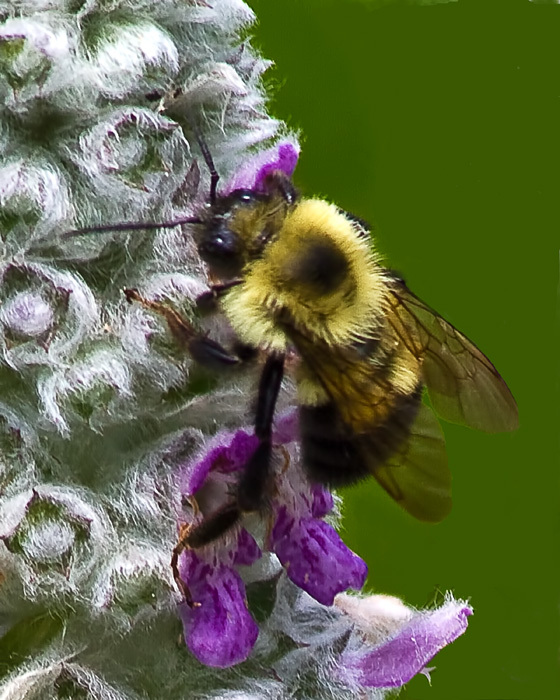 I shot the same lamb’s ear flower stalks and waited for the bees, but didn’t get as good a one as this. Yes it was…..those bees wouldn’t stay still. I was jumping around like a JUMPING JACK trying to keep up with them. Love the close up texture of bee’s ‘fur’ and ‘fuzziness’ of the flower. Nice shot! PS. I am Lou’s sister. Glad he inspired you to set up this blog.